I have a few cookbooks on my shelf that are completely under-appreciated. Tyler Florence's Eat This Book has been gathering dust there for years. No excuse, I just sort of forgot it was there. Starting today, neglect no longer! This book is dynamic, colorful and approachable. It has a great variety of recipes from all over the globe, and while most of them have scarily long ingredient lists, the techniques themselves are mostly quite simple. I had almost all of the ingredients for this recipe on hand already. 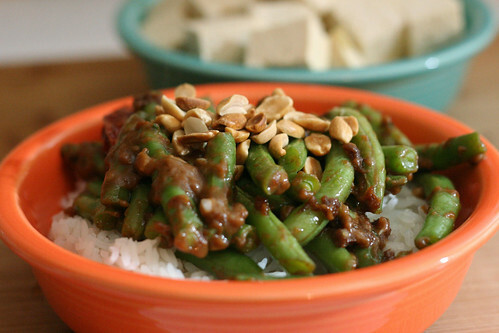 This dish, Stir-Fried Green Beans with Peanut Sauce, Fresh Tofu, and Chiles, is a study in contrasts. Flavorful and mellow, hot and cold, colorful and pale, spicy and mild. Each of these contrasts complements the others. It hit the spot perfectly on a chilly fall night. I especially like that the tofu is served on the side, rather than incorporated into the stir-fry; something new that I'll try more often. To make this dish vegetarian, substitute vegetable broth or water for the chicken stock. I prepped ahead for this dish using mise en place, and it really expedited things once I started cooking. I highly recommend this method with such a long ingredient list. Not only is it efficient, but it lowers the stress level and ups the fun level. 1. Heat the peanut oil in a wok over high heat. When the oil is smoking hot, at the beans and stir-fry for 2 minutes. Remove to a plate lined with paper towels to drain. Very carefully, drain all but 2 tablespoons of the hot oil into a heat-proof bowl (Amy's note for the klutzy: I drained it all into a bowl and then put 2 tablespoons back into the wok). 2. Add the ginger, garlic, green onion, and chiles to the oil remaining in the wok and stir-fry until you can smell the fragrance of the aromatics, 30 seconds to 1 minute. Return the green beans to the wok and season with salt and pepper. 3. In a small bowl, stir the chicken stock with the cornstarch to make a slurry and add that to the wok. Add the soy sauce, vinegar, sugar, peanut butter, and orange zest (Amy's note: I had these all pre-combined in one bowl). Simmer until the sauce is thickened and the beans are tender, 5-7 minutes. 4. Garnish with the tofu, sliced jalapeno, peanuts, and cilantro, if desired. Serve with steamed rice. Did you just leave the tofu uncooked? I can't wrap my head (tongue?) 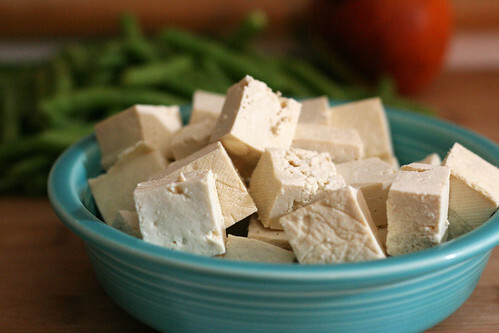 around cold, uncooked tofu with a spicy stirfry. Would you recommend leaving it this way rather than giving it a quick saute on its own? Yep, it was cold and uncooked, that's how the recipe was written. Feel free to prepare it however you feel would be the best-tasting for you, but we enjoyed it. Interesting. I haven't had much success with stir-frying tofu, so I think I like this as an alternative method. Looks delicious! I love spicy green beans. Wow, yummers!! This looks delish!